Artwork: Daxi. ©2012 All Rights Reserved. 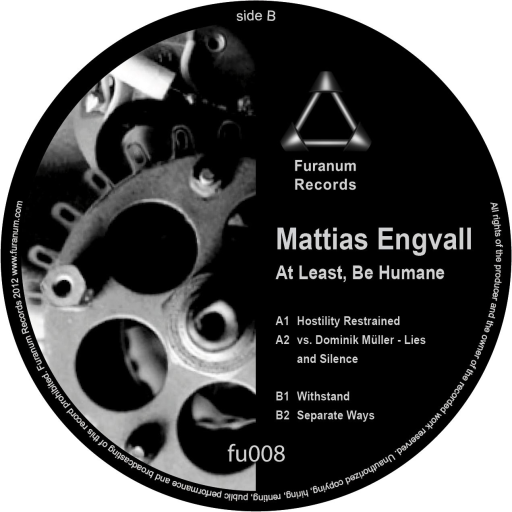 Returning to Furanum for his second EP, Mattias Engvall delivers a heavy yet decidedly more atmospheric dose of cold pulsating energy, doubtlessly drawn from the frost and lasting darkness of the nordic north. 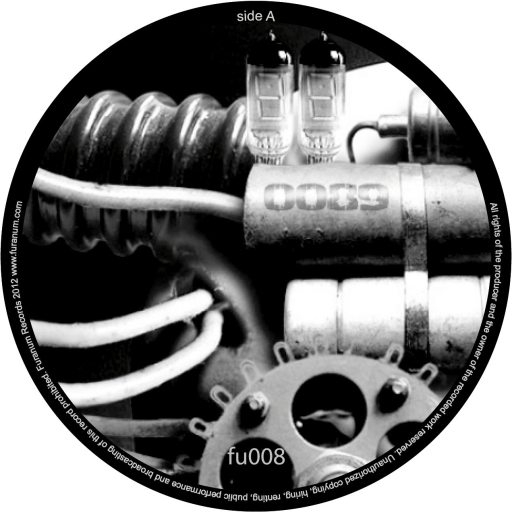 At the outset, ‘Hostilities Restrained’ sets the pace for the release, as a haunting ambiance is quickly broken by beast-like howls of industrial machinery, to be soon matched by continuous pounding palpitation. Revving up the EP’s engine further, label-head Dominik Müller joins forces on ‘Lies and Silence,’ where what begins as a relatively minimal arrangement, through successive layering of mechanized clangs and echoing wails gradually escalates into a full sensory assault, only slowing down once mid-way to let a dirty synth take the lead. Next, relentlessly driven pressure waves bring about a sense of unstoppable mechanical momentum in ‘Withstand.’ Hurtling toward a climactic plateau, powerful melodic overtones of a deep-seated melancholia imaginably reflect the experience of one seemingly faced with the agony of abandonment in the midst of a desolate and dystopic landscape. Closing the release is ‘Separate Ways,’ a late night burner animated by thick brooding soundscapes that creep and weave their way around a beat which could easily be mistaken for the muted impact of a blunt weapon. The dense acoustic fog is eventually pierced by a menacing high-end progression that finally subsides and gives way to a slowly receding epilogue.